In some ways, it's easier to lose weight if you are heavier; in other ways, it's harder. In comparison to a lighter person, you burn more calories through the same amount of exercise, CSG Network says. However, being heavy may limit your ability to perform certain exercises that would help you lose weight. Consult your doctor for medical advice before implementing lifestyle changes intended to aid weight loss. The heavier you are, the more calories your body burns during exercise and performing its basic metabolic functions throughout the day. For example, a 100-lb. person walking for 30 minutes at a brisk pace of 3.5 miles per hour burns approximately 91 calories, CSG Network says. A 200-lb. person walking for the same duration and distance, at the same speed, burns 182 calories. Therefore, a heavier person can burn more calories than a lighter person doing the same exercise. This can lead the heavier person to create more of a calorie deficit, thereby losing a greater amount of weight. Behavioral factors and habits may make it relatively more difficult for an overweight person to lose weight. Unless your extra weight is the result of a disease, a side effect of medication or similarly linked to physical factors beyond your control, it's likely that you gained the weight over a period of years, through eating and lifestyle habits. For example, if you have gained weight over a long period through overeating and a lack of exercise, losing this weight requires a long-term overhaul of your eating and exercise habits. Although an overweight person burns more calories during exercise than a healthy-weight or underweight person, the lighter person may be physically able to exercise at higher speeds and for a greater duration. So it may be easier for a lighter person to lose weight through more intense, longer periods of exercise that burn a greater number of calories. For example, a 100-lb. person may be capable of running at a six-minute-mile pace, which over the course of 30 minutes burns 364 calories, says CSG Network. A 300-lb. person exercising for 30 minutes may be limited to walking rather than running. This same duration of exercise at a 3 mph walking pace would burn only 239 calories. When trying to lose weight, a common method is to reduce the number of calories you consume every day in order to create a calorie deficit. However, your body needs a certain number of calories and other nutrients daily. 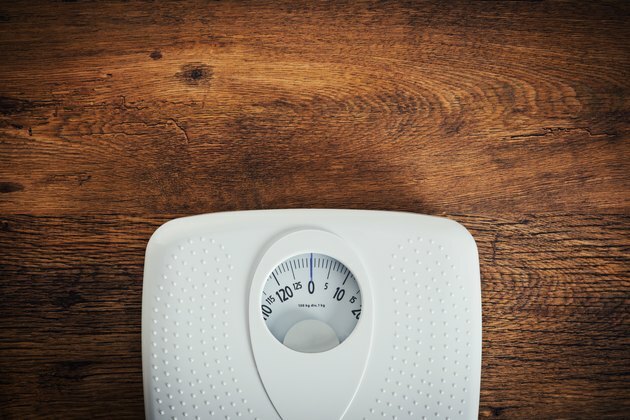 Even when dieting for weight loss, it's considered unsafe for any male to consume fewer than 1,800 calories daily, according to the BMI calculator. For a female, the safe lower limit is 1,200 calories. Medical News Today: Is Obesity a Disease?